I purchased this for my son. After receiving it I noticed that it was the type of fabric that had the sheen and that looked like it would pick easily. It was very pretty and true to the picture but due to my son having a large dog I didn't think it would be practical. I returned it. The Madison Park Amador bed set is where casual meets contemporary. Sleek piping of the fabric on the comforter and pillows gives a strong visual dimension and ties the whole bed together. The clean color lines of this set make it simple in a way that you can accessorize any way you want. In addition, there is a floral pillow that adds a softness which is different from the manipulation of fabric and colors on the rest of the set. I love this comforter set. The navy, silver went well with grey curtains that I had in the room. I added silver lamps and the room looks great. The comforter is not too heavy so it is good for summer. In winter I will need to add a blanket. I purchased this set for my husband and I as a surprise for our new home master bedroom. He has told me many times how much he really likes the look and feel of the set. It matches well with whit or ivory. I only wish it had Euro Shams too. 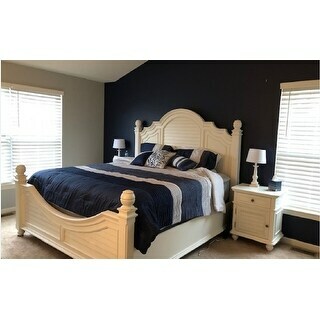 This comforter set is soft, fluffy and the colors are navy, grey and a lighter softer blue. It's beautiful! I am absolutely thrilled with this purchase!! I am planning on ordering another complete set in case my first one starts to get old looking. It is fresh and crisp, simple but elegant!! The colors are true to the picture, deep navy, shiny silver ... I have navy antiqued furniture and this set went perfect with it!!! Fantastic comforter set. Great fabric and wonderful colors. Beautiful comforter set!!! Very well made, silver fabric is lovely, and the blues are as pictured. I am very happy with the set. It gives my room an elegant winter style. Stunning bed set!!! It is strikingly beautiful! We have it in the guest room of our ocean front condo and it fits our nautical beach theme perfectly. I really like this bedspread. Sadly it was torn at the top of the bedspread but I like the bedspread enough to just accept that the pillows will cover the 2 1/2 tear. The pillows are very nice looking as well. There is barely any blue on this comforter. Just the bottom. The picture makes it seem like the white is an accent when really it's quite a lot. This is not the softest comforter I've ever owned but it is nice and fluffy and it looks great. Good price for this. It looks very nice. It had some stichting I felt could have been more hidden but barely noticeable. Love the color. I was pleasantly surprised with this set. I purchased it for our guest room and it is perfectl. The con is the directions say “spot clean.” REALLY?! That’s a bit ridiculous for bedding!! I washed it anyway as I wash everything before I use it. It was fine. Very attractive. Used on a not frequently used bed. Loved the colors, very pretty, but the comforter was very small for a king size and the fabric was very itchy and uncomfortable. I purchased but did not keep I ended up returning it for I didn’t care how the top side of the comforter looked or felt. It almost looked like it has poor quality material looks pretty and all but also looks cheap. Love this comforter set. Looks better in person. Really added a nice pop of color to our room. Great quality for the price. You won’t be disappointed. "does this come with a mattress included"
"I want this but my last queen was short and I had to mail it back I want to know if you have this in Cal queen or will it"
This is not available in a Cal queen size. The queen measures approximately 90 inches wide x 90 inches long. "is there cross stitching in the comforter?" No, the comforter has ribbing in some areas but the smooth areas are just material. The material has a pretty shimmer to it ! I absolutely love mine! "Does this product for Queen size include matching cases for the two sleeping pillows?" "Is the top end of the comforter grey, or dark blue? It's hard to tell in the picture." The top of comforter is striped one end is grey the other end dark blue. I have the grey up at the headboard but you could lay it the other way and have the dark blue at that end. "The Madison Park Amador Navy Comforter set looks very similar to the Madison Park Navy Chester Comforter set. Are these the same with different names?" "Does it take almost 2 weeks to reiever comforter sets I order one said also 2 weeks"